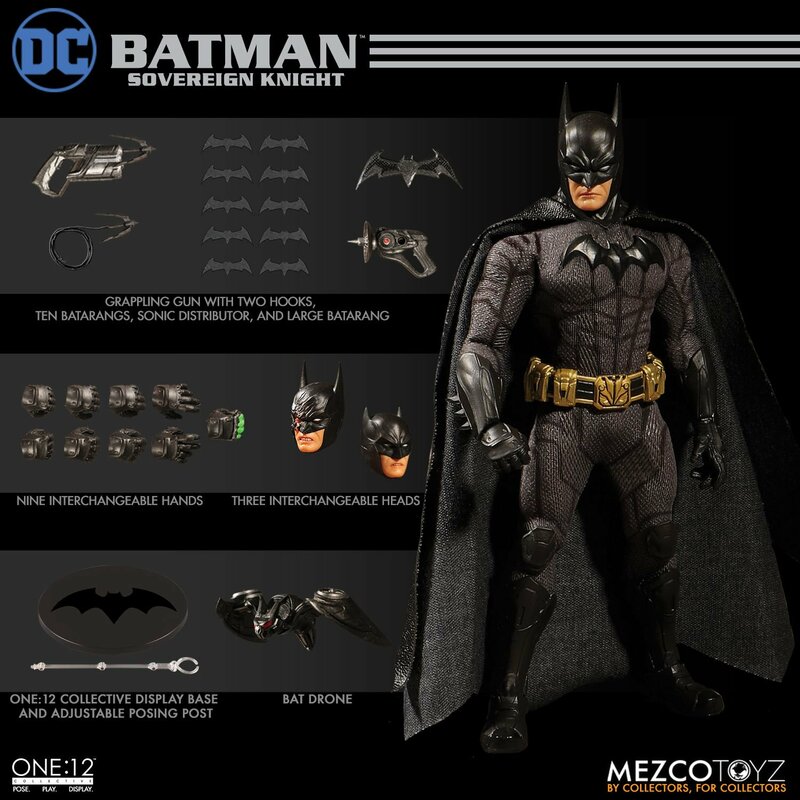 Mezco Toyz has opened up pre-orders for their new Sovereign Knight Batman One:12 Collective Figure. The figure stands over 6.6″ tall with about 30 points of articulation. 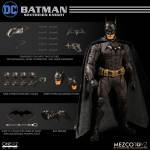 It includes multiple interchangeable hands, three interchangeable portraits, a leather-like cape, multiple batarangs, a bat-drone, a grappling gun, hooks and more. The included hooks can be attached to the grappling gun. The figure is priced at $80. 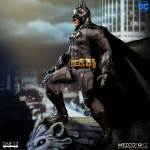 The Sovereign Knight Batman Figure is due for release between December 2018 and February 2019. See pre-order link, details and photos after the jump. There are so many great comic,movie,game & concept versions of Batman..that i am buffled why would anyone would care about this design. HS looks neat but other than that meh..
ps: Reading the description, really made me laugh out loud. 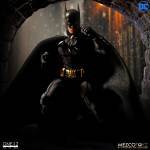 "Bruce Wayne has enhanced his tech greatly from the beginning of his war on crime. 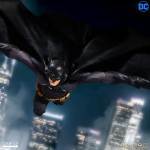 The Bat-Suit has been augmented to provide more protection and greater mobility" . I can not see what they are trying to sell to me, because i just see armored gloves boots and kneecaps. I know people will take me as a hater but let me explain myself. This figure is going to cost 80 dollars. 80 dollars is the price of Tactical Batfleck which has a tonne more sculpted parts and it's a complex combination of rubber & cloth parts. You give 10 dollars more and you take the IM which has magnetic helmet and light on feature. And as i said, there is no backround to hold onto, no movie, no comic, it's a concept/variant and tbh doesnt offer anything NEW to the legend in order to draw my attention. If it costed 30-40 bucks i would say "i stfu and give you my yeyo". The way i see it, it's a poor executed effort from a company to maximize it's profit (which is understandable). I don't know, the costume looks too much like DC movie Batman with a comic head. Have you had them in your hands? 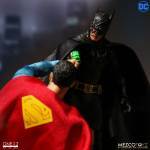 I think most people would get it because of the feel of the quality action figure Mezco provides. It's unlike any other. The only company that looks comparable is Storm Collectibles. Which arguably is cheaper, but not all the soft goods. The suit on the figure looks great! obviously it's using the same material as the BVS one but love the add on parts like the knee armor and the gauntlets,cowl and boots even the crest symbol it reminds me a mix between Arkham's series Batsuit with a mix of more of the modern looks lately in the comics in DC rebirth. 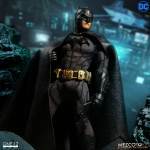 So it does fit well on the real world look for Batman. I'm more intrigued on see the accessories with this figure now. 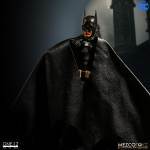 I don't know about this one, the head looks a little to large and I don't like the way the cape forms around the neck area. My brother. 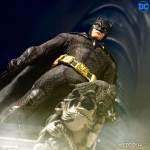 I am aware the Q mezco provides (most times-because if i show you my tiger stripe wolv. You will realise that they did not deliver) but there are already HQ Batman mezco figures. 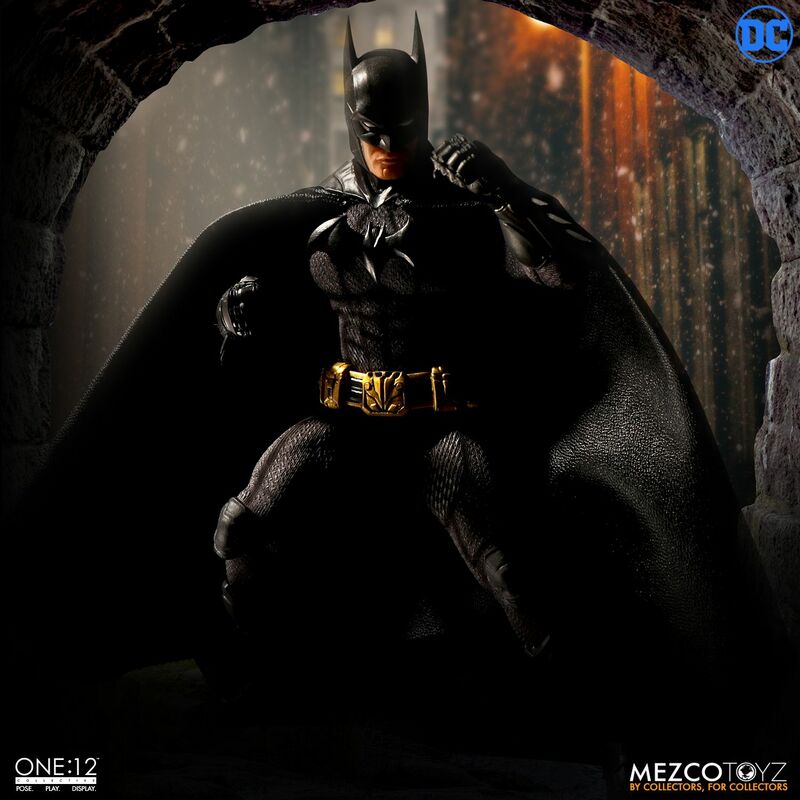 Make a Year one batman, make a year 100, make Hush, make Knightfall, make leeBermejo one. So many good versions with a story backround! I mean make these first. 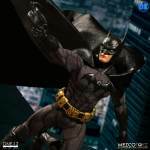 Is this the figure that people thought would be 1989 Batman? 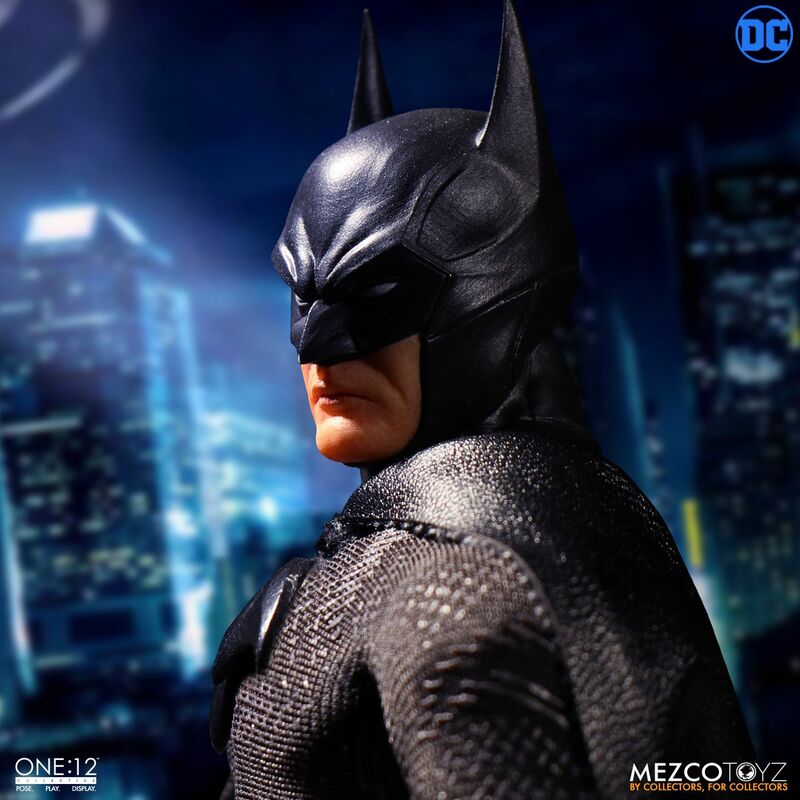 When I saw the long ears in the teaser shots, I was hoping for a 1970s-90's Batman (i.e. 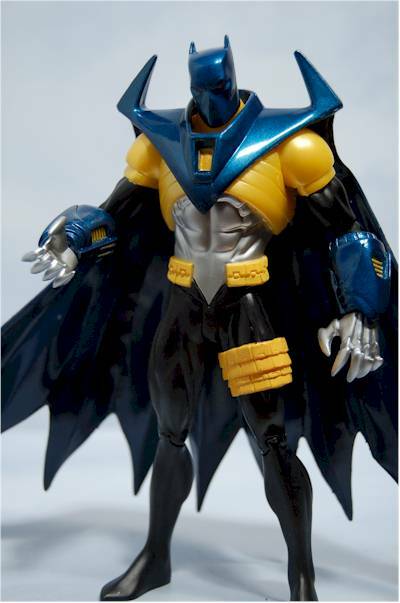 Neal Adams look, medium blue cape/cowl, yellow oval). Given the quality of the One: 12 stuff, I was thrilled to think we might actually get a fabric costume representation of that era. This one seems like a recycle of BVS/Justice League and the reinterpretation of the origin Batman. Gloves, boots, and cowl look great, but I'm already on pre-order wait for two Mezco Batmen right now. If this one had been the classic 70's suit, I'd be jumping on it. I like it - will be preordering this one - and I bet most of you will too. I kind of like the not quite 100% exact to an era, gives some flexibility in displays. Agree, they should have gone with a more distinct variation for this one. Mezco's take on Knightfall Batman would be great. That would be amazing. 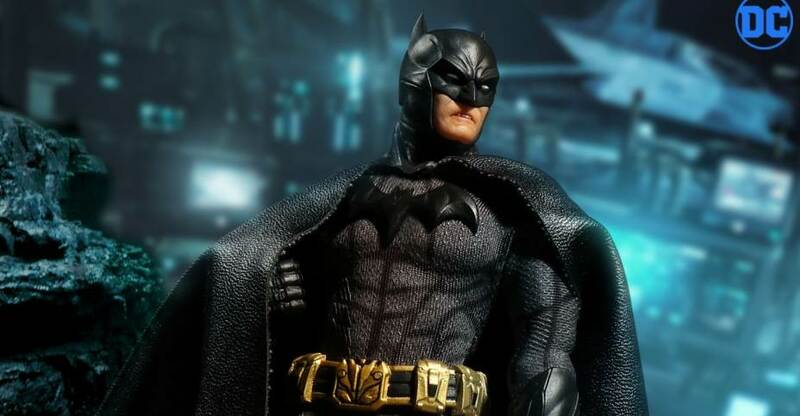 I'm a little disappointed in that this new Batman, like the Ascending Knight versions, does not seem to connect to any comic or media tie in. I loved TDKR and the movie versions. 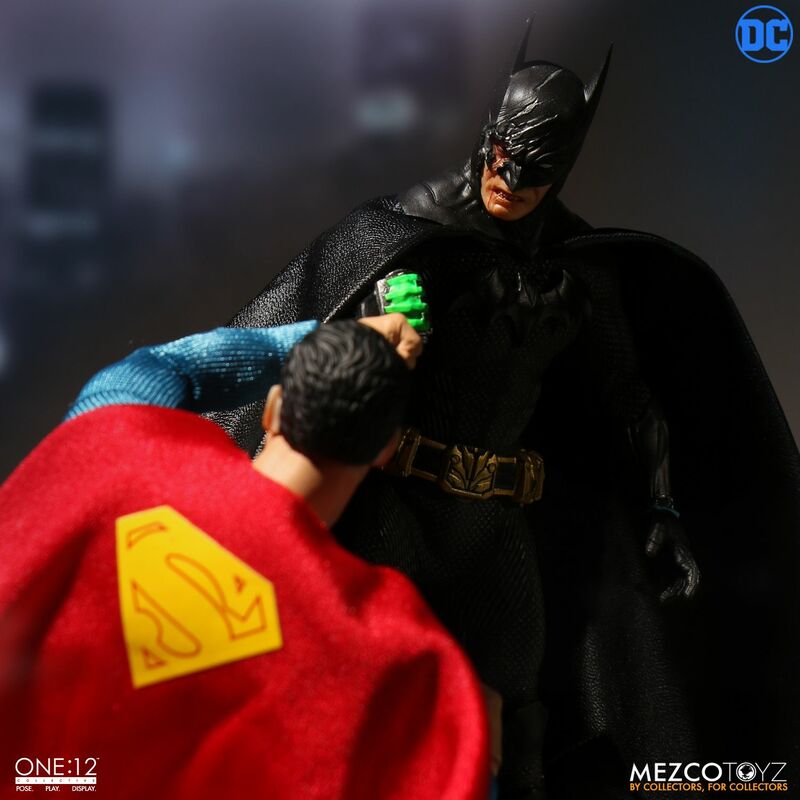 I would prefer to see Batman figures along those lines instead of something entirely made up by the folks at Mezco. The boots and gloves jump put at me as being very Akrham inspired which I'm a-OK with. Same with the head sculpt. It's hard to get a feel for these figures especially in side shots. While I'll wait for a full reveal this definitely has me interested. And retroactively more interested in their early years batman. Azbat by Mezco... I'm anxious for it already. I hope the 3 versions of Ascending Knight turn out to be great and I hope this one gets a few variations, as well. 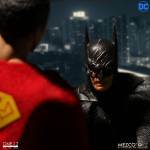 Still waiting for Darkseid, Terry, and a whole bunch of other figures Mezco announced. 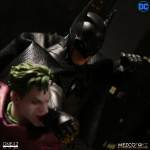 There was an interview with the head of the line that mentioned they had prototypes or mock-ups of Superman, Armored Batman, and the Joker. IIRC, they put it on hold to concentrate on current hot items as the TDKR license is evergreen. 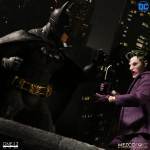 I think the same reason was used for their Keaton Batman figure not making it to the front lines, though there was also mention of market saturation for Keaton figures. I'm with you. That's exactly what I wanted. Nothing terrible about this one, just doesn't excite me particularly. 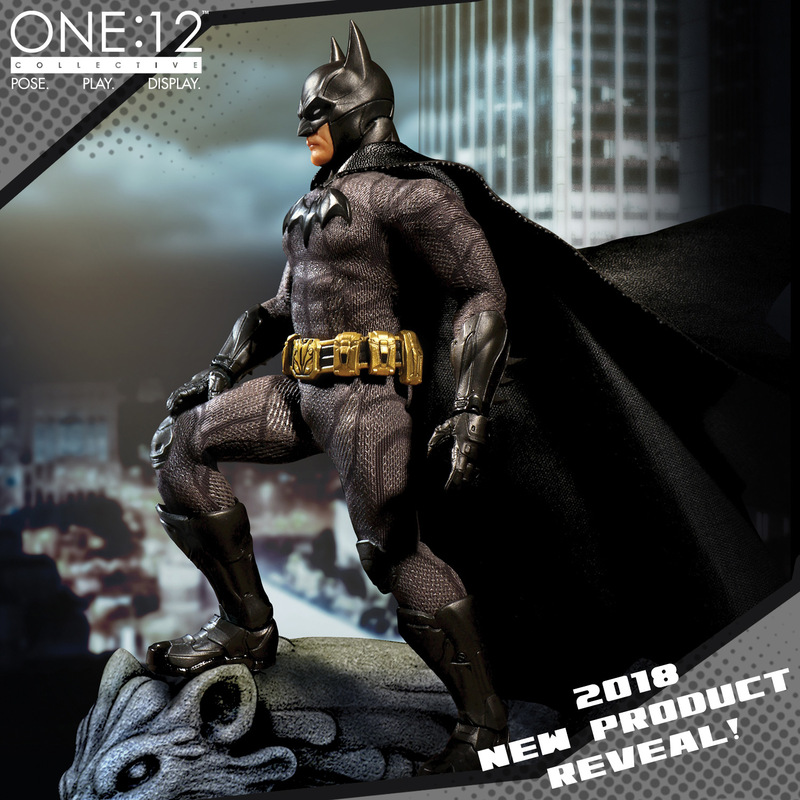 Maybe I'm not understanding the concept, but how could there be market saturation when there have only been about five or six Keaton Batman figures released in the past 10 years or so? 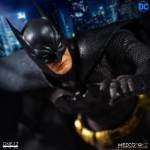 Compared to every company trying its hand at Bale Batman figures or Iron Man figures, the variety of Keaton Batmans is a drop in the bucket. It's not terribly distinct from their last Batman, is it? It's like they combined it with the BvS model. All three on the shelf would seem redundant, especially compared to the much more striking Wolverine and Deadpool variants. How are those tiny little baby bat ears "fixed"? :P No offense, I just never cared for the tiny bat ears.